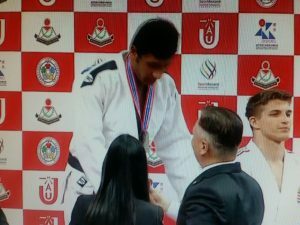 Qaisar Khan Afridi once again showed his worth in Asian Cup Cadet event in Macau. He won the Silver medal. Earlier Qaisar won the preliminary round against Tajikistani Judoka, Kurbonov Emomrizo who in World ranking is No.12. In the Semi-Final, he won on Ippon point basis from a Mongolian player. Qaisar Khan won the Bronze medal in Asian Cup Cadet, Hong Kong by defeating Iranian Judoka, Abolfazl Shojaei Bakhtiyari, Judo World No. 18, by ippon – highest score achieved in martial arts. Qaiser had also won a bronze at Asian Cup Cadet held in Kyrgyzstan.